​Visible Soul The musings and diatribes of a New York actor and playwright. Joseph Vitale, a semi-finalist for the 2012 Eugene O’Neill Theater/National Playwrights Conference, is the author of a number of plays, including The Fourth State of Matter, which was performed in August and September 2011 at the Theater for the New City in New York and was later nominated for the National Playwrights Conference. His one-act plays have been produced at the Hudson Guild, Barrow Group and Manhattan Repertory theaters in New York and at the Theater Project in Maplewood, NJ. He is a member of the Dramatists Guild of America as well as the Theater Project Playwrights Workshop. He is a graduate of Rutgers University and the Columbia University Graduate School of Journalism. I wrote my first short story in 8th grade but probably did not aspire to be a writer until I was in college. I began to write seriously in college (poetry, short stories) and wound up being the co-editor of the Rutgers-Newark literary magazine my senior year. I also had my first play produced that year as a member of the college’s playwrights workshop. After graduation, I got my first job at a newspaper and later attended Columbia University’s Graduate School of Journalism. Tell me about MURROW. What compelled you to write the piece? How do you feel rehearsals are going? What do you love most about the play? The idea for Murrow was born at Columbia. I enrolled in a class, “Media, Law and Society,” that was taught by Edward R. Murrow’s former producer, Fred W. Friendly. It was during Fred’s frequent stories and reminiscences about working with Murrow – and especially the lead up to the McCarthy broadcast of 1954 – that I thought, “This man’s life would make a remarkable play.” After graduation from Rutgers, I had taken playwriting courses at the HB Studio in New York, so I was oriented to the theater. First, I envisioned a play with other characters, but the more I thought about Murrow, the more I realized that the perfect format would be a one-man show – a suitable vehicle for one of the great communicators of all time to command the stage and tell his story directly to the audience. What I love most about Murrow was his courage. He took on McCarthy at the height of his power when he (Murrow) had so much to lose. He was laying his career and his reputation on the line to confront someone who he believed was doing serious damage to the country and to American values. I was also moved by Murrow’s conviction that journalism at its best is “teaching.” He believed that journalists have a responsibility to help people think critically and to really understand what is happening in the world, not just to appeal to their fears or emotions. Writing at combines human drama with a larger story or context. For example, The Crucible, which examines relationships between human beings but also tells the larger story of fear, prejudice and the horrifying power of the crowd. Another of my favorite works is The Lion in Winter, which, again, sets a searing family drama against the wider sweep of history. Who or what has been the biggest influence on your work as a writer thus far? In terms of the stage, the two playwright I was initially drawn to were Tom Stoppard and Peter Shaffer. I was astounded by Stoppard’s wit and his ability to meld dazzling word play and the deconstruction of language with larger philosophical ideas. I still think Rosencrantz and Guildenstern Are Dead is one of the most remarkable plays ever written. With Shaffer, I was attracted to his boldness and fearlessness in wanting to tell “big” stories, such as Equus andAmadeus. In fact, his The Royal Hunt of the Sun was the first Broadway play I ever saw while I was in high school. I’ve just finished a play about a little know back story concerning the Cuban Missile Crisis of 1962. Again, it’s about human beings – two men, one American the other Russian, who wound up negotiating an end to the crisis outside of the glare of publicity. It’s the kind of play I love to see or write -- a human drama set within the context of a larger historical event. ​Theater professionals wish each other well onstage with the phrase "break a leg." 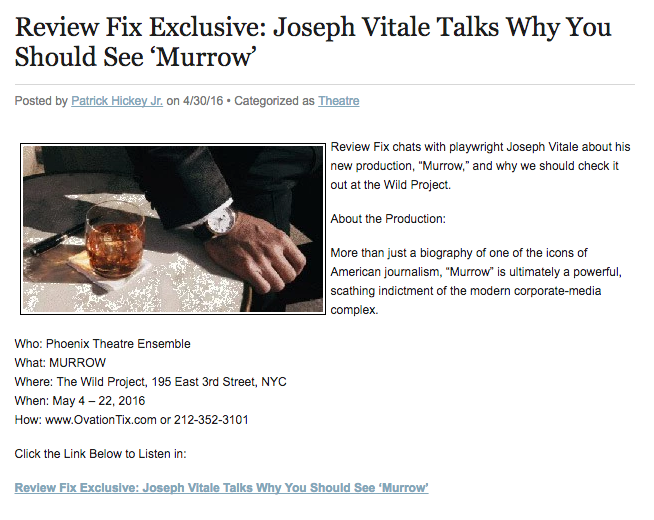 Chances are the friends of Joseph Vitale will settle for a simple "good night and good luck" in hopes that the long-awaited professional stage premiere of his play about Edward R. Murrow will be a hit. Vitale, executive director of advancement and planning at County College of Morris, will see his one-man drama about the legendary broadcast journalist come alive Feb. 7 and 8 at the Burgdorff Community Center in Maplewood. Both performances of "Murrow" will be followed by an audience discussion featuring CCM faculty members and members of the New Jersey media. "His career spans the history of broadcast journalism in the United States," Vitale said. "He was instrumental in the birth of both radio and television news reporting. He warned, early on, about the corrosive influences of both advertising and entertainment on the news. In those two areas I thought the man was absolutely prescient, unbelievably so, that he could see these things beginning in the late '50s and actually warned against them. Joseph Vitale, executive director of Advancement and Planning and president of the Foundation at County College of Morris (CCM), will soon see his latest play take the stage at a well-known Northern New Jersey theater. The production will be accompanied by a panel featuring two CCM professors. Theatrical production company The Theater Project will present Murrow, a one-man show written by Vitale about the life of famed broadcast journalist Edward R. Murrow, on Saturday, February 7, at 8 p.m. and Sunday, February 8, at 2 p.m. at the Burgdorff Community Center in Maplewood. 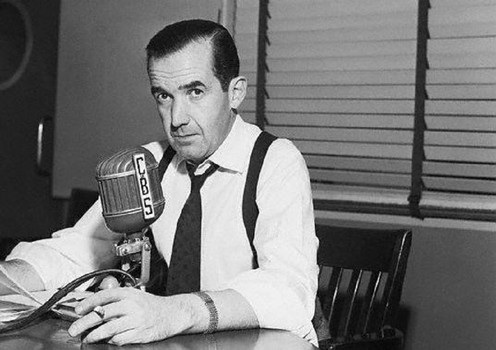 The play traces Murrow's life from his early days in radio, through his broadcasts from London during the Blitz, to the McCarthy broadcast of March 1954, and ends with his departure from CBS News in the late 1950s. The play stars veteran New York stage actor Joseph Menino and is directed by Bob Angelini, artistic director of the ReVision Theatre in Asbury Park. The Theater Project will present Murrow, a one-man show about the life of famed broadcast journalist Edward R. Murrow (photo), on Saturday, February 7 at 8 p.m. and Sunday, February 8 at 2 p.m. at the Burgdorff Community Center in Maplewood, NJ. THE YOUNGTOWN EDITION The award-winning newspaper at the County County College of Morris, website run by Beth Peter.